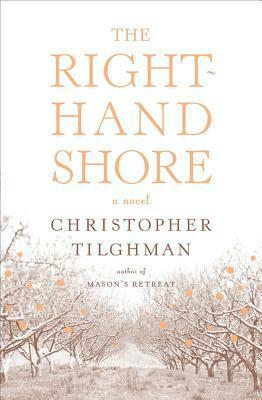 This novel–the first book I’ve read by Tilghman–was one of the three finalists for the Library of Virginia Award for Fiction this year, along with The Yellow Birds by Kevin Powers and my own What the Zhang Boys Know. While I know my book is good, I feel even better about winning the Award after reading the other two books. I’ve written earlier about The Yellow Birds but now I can say that The Right-Hand Shore is also an exceptional book. It’s structure is unique, in my reading experience. It begins in the present time of the narrative (1920s) when a visitor arrives at Mason’s Retreat (a vast estate on the Eastern Shore)–a possible inheritor of the property. He is interviewed by Mary Bayly who is seeking to determine if he is suitable to take the reins of the operation, a farm that has transitioned from tobacco to peaches to dairy. After his meeting with Mary, he meets with Mr. and Mrs. French, the farm manager and his wife who have worked for Mary’s family for decades. The succeeding chapters are the stories they tell about the various players in the family history, until we finally circle back to the present time having learned the secrets of the family and the estate. It’s a convoluted story, with a lot of characters, but it wrestles with big themes. It’s a terrific historical novel.